If you are reading this article, chances are that your journey through high school did not require you to skip meals, work side jobs, and forgo furnishing your house to pay tuition fees. Chances are that your study lamp didn’t cause eye problems and breathing difficulty, and that your school sent over 10% of its graduates to college. As unlikely as these scenarios sound, they are the lived reality of tens of millions of secondary school students around the world. Some of them are my friends. In 2008 I met John, a remarkable student in 10th grade who was at the top of his class. (Pseudonyms have been used to protect the privacy of the individuals featured in this story.) John slept on a four-foot wooden bench. This did not seem to concern him too much though. He was busy studying late at night, often until 2AM, and had other needs to worry about, such as getting enough to eat. John and his mother were landless agricultural laborers from Western Kenya. They lived next to a clinic I was renovating that summer, and I had hired John as a translator. His mother worked odd jobs as an agricultural laborer, typically earning between $0.80-1.10 per day. John is now in university, studying business. Life is still difficult, but his future is promising. John’s triumph against all socioeconomic odds is inspirational, and tragically uncommon. Fewer than half of Kenya’s primary students have the scores and financial means to enroll in secondary school. Once enrolled, there is little to no remedial help for those who have fallen behind. In rural areas, that’s almost everyone. Consequently, only two thirds of high school students ultimately write the national exiting exams for the Kenya Certificate of Secondary Education (KCSE). In government-subsidized county schools, 89% of students fail to achieve a C+ or higher on the KCSE. For these discouraging results, parents are paying dearly. In 2010, average high school fees in Kenya, even after government subsidies, were $4502, while per capita income was just $978. The state of secondary education in many other countries in Sub-Saharan Africa is similar, if not worse. It can be tempting to view this grim state of affairs as a stubborn and unavoidable developing country malaise – a malaise that will only lift if incomes grow enough to fund better-resourced school systems. Ten years ago, this may have been a reasonable assessment, but not today. There is a perfect storm of technology and pedagogy innovation brewing in and around the education sector, and it may transform how teaching and learning occur, even in the world’s poorest communities. In January 2015, I received a remarkable anatomy lesson from a boy named Rahul from the village of Pisangan in rural Rajasthan, India. Rahul had learned the names of every major bone in the human body, a feat he proudly demonstrated on a plastic demo-skeleton with uncommon zeal and charisma. While his lively Hindi explanations were largely a musical blur to this Anglophone’s ears, what was not lost on me was the fact that Rahul, age 13, was illiterate and out of school only a year before. At age 12, Rahul was admitted to a program for out-of-school children run by the Indian charity Doosra Dashak (DD), which means Second Decade in Hindi. The charity runs 4-6 month residential learning camps for children ages 10 and above who have never been to primary school, or who left school at a young age. The results are encouraging: roughly 85% of the children are able to read short stories, write paragraphs, and perform fifth grade mathematics by the end of the program, with most entering the government schools at the 5th or 6th grade level thereafter. One of India’s largest Education NGOs, Pratham, has achieved similar results with its Read India program. Despite years spent in the classroom, more than half of India’s grade five children cannot read a simple paragraph at the grade 2 level. Yet, after only 30 to 40 days of instruction in Pratham’s intensive applied literacy camps, almost 80% of participants become readers, in that they are able to read simple stories. A simple principle at the core of Doosra Dashak and Pratham’s programs underpins their success: teach at relevant level (TARL). TARL groups students based on their learning needs, and has them develop requisite core skills before progressing to harder material. This intuitive idea is backed by both learning science, and rigorous field experiments, yet it is largely at odds with the one-size-fits-all, age-defined cohort model we see in schools around the world. Many students in developing countries are bright, motivated, and willing to do their part to secure a better future. The main problem, it seems, is not with the students, but with the education system. The question is, can TARL principles be implemented at scale, even at the secondary school level? If so, can we do it at a price point that governments and citizens in low-income countries can afford? Education is often seen as a domain for professional educators, policy analysts, and charities. It is. But it is also increasingly a domain for technologists and entrepreneurs. Nowhere is this truer than in East Africa, where high tuition and disappointing quality have generated powerful market forces supporting a number of fast-growing for-profit education ventures. The world’s largest private school chain, Bridge International Academies (BIA), has leveraged information technology to standardize curriculum delivery, dramatically reduce staff absenteeism, and streamline tuition payments, all while serving over 100,000 Kenyan primary students for $5-$6 a month. BIA’s investors include Bill Gates, Mark Zuckerberg, and venture capital firms such as Khosla Ventures. Another rising star in Kenya’s Ed-Tech scene is Eneza Education, a mobile-phone based tutoring platform for primary students. Eneza hit 350,000 unique paying users in January 2015, with a large number coming from rural and remote parts of Eastern and Northeastern Kenya, including the Dadaab Refugee Camp near the Somali Boarder. The education technology industry has tremendous potential to improve the life prospects for hundreds of millions of children around the world, rich and poor alike. In addition to developing digital content and educational hardware, one significant market opportunity stands-out as especially promising, and largely untapped: education analytics and artificial intelligence. Over thirteen years of K-12 education, students answer hundreds of thousands of questions through their homework, assessments, and in-class practice. If a modest fraction of this information were fed into a system that could diagnose learning difficulties, misconceptions, and dynamically adapt to each student’s needs, then students with access to a no-frills tablet could enjoy a world-class learning experience. The falling cost of information technology and the explosive growth in free or affordable digital learning content is creating an environment full of possibilities awaiting discovery. I believe affordable personalized education is one of those possibilities within reach, even in developing countries. In a few weeks, I will be returning to John’s District in Western Kenya to test this belief first-hand. Is it possible to deliver first-rate high school education for under $200 per student per year? Over the next 18 months, I will be looking for an answer. With the support of D-Prize, Students for International Development, The Olive Branch for Children, and a team of brilliant MIT / Harvard students, a new kind of school will open its doors in Kenya and Tanzania later this year. The school will have no classes, no grade levels, and no droning lectures at the chalkboard. Instead, students will progress through a custom-built journey that meets their personal learning needs with the support of low-cost tablets, a wealth of digital and traditional learning resources, and a purpose-trained coach. Of course, hundreds of things could go wrong. The English level in the Khan Academy videos may be too advanced. Fine – we’re adding to the Kiswahili translation library. Our tablets might break, or go missing. 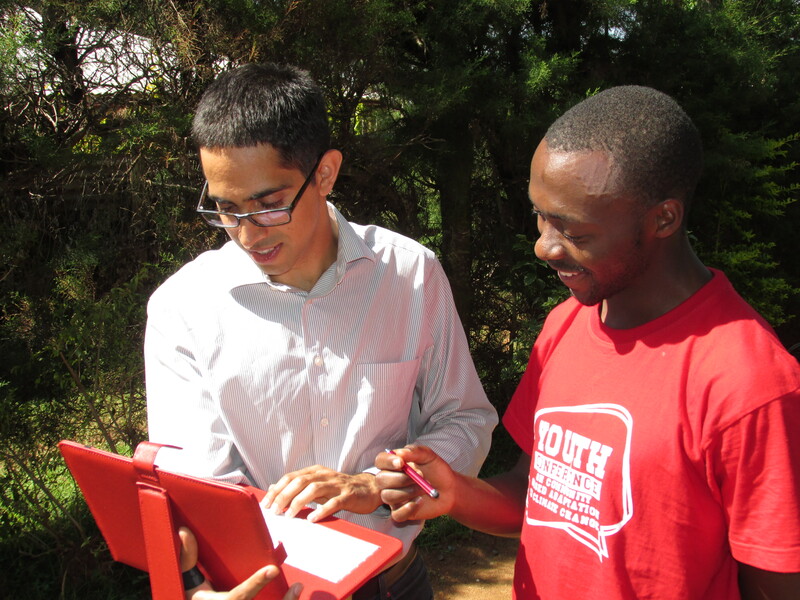 Good thing 10 cheap tablets cost less than a month’s salary for a top Kenyan math teacher! What about electricity? We’ll use solar charging, and weld the panel to the roof if need be. What about the infrastructure? We’ll rent local space. We need only 16 students to form a school – that means we can operate in their home villages, cutting commutes, and saving on boarding costs. Many things could go wrong, but many things could go right. As a scientist, I love experiments. Not all experiments work, but when they do, sometimes they allow us to create things that never were, solve problems that seemed intractable, and ultimately change the world. I hope this will be one of those experiments. If you want to find out, please follow us. There will be more news to come! Michael Beeler is a 2012 fellow of the Fulbright Science & Technology Award program from Canada. He is a PhD Candidate in Operations Research at the Massachusetts Institute of Technology and Founder of Students for International Development.